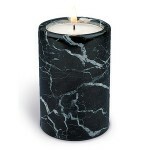 A high quality solid marble tealight candle holder. This is a beautiful piece which is highly polis..
Set of 3 Cylinder shaped Marble Tea light holders of varying sizes. High quality solid marble tealig..